Atari will not give up but Nintendo could care less. The Atari 7800 prosystem is an 8-bit game machine that was the successor to the failed Atari 5200 and was originally suppose to hit the market in 1984 but it got put on the back burner after the entire company was sold off that year. After the NES became successfully however, Atari returned back to the console market to see if they still had what it takes to compete. The 7800 has all new arcade-like controllers and it has near perfect arcade translations of older games like Ms. Pac Man, Galaga, Asteroids and Dig Dug. Unfortunately it also has lousy ports more updated arcade titles like Ikari Warriors, Xenophobe, and Double Dragon. The Atari name was still poison after the Great Video Game Crash of 1984 that was caused by Atari's multi-million failures like Atari Pac Man and E.T. for the Atari 2600, which killed the entire Video Game industry. The Atari 7800 got easily destroyed by console new comer Nintendo and their NES 8-bit game machine in the late eighties. Unlike the NES though the Atari 7800 games always seem to work on the first try mainly because it was an well designed top loader system, as oppose to the awkward box-like design found on the NES. I never had to clean my 7800 games like I had to with my NES games because the circuit boards were always well protected in those Atari cartridge cases. If you ever get bored with the 7800 games (and you will) then you can always play the Atari 2600 games on your Atari 7800 because it's one of the first machines ever to feature backwards play similar to the PS2. Now you can play well over 1,000 games on one machine! Why did the Atari 7800 fail to create any real buzz? Sadly there is no game on the Atari 7800 quite as good some of the NES and Sega Master System games like Super Mario Bros. 3, The Guardian Legend, Final Fantasy, Y's The Vanished Omen, Phantasy Star, and many more mainly because the Atari 7800 games are just too arcade-like and they don't have any save features like battery back up or passwords either. The specially made pro controllers for the 7800 were designed to be a step above the awkward 5200 pads but these 7800 sticks are still far from perfect. Despite the return to the re-entering analog stick, its way too weird and its hard to get a good decent grip on the analog stick and I don't like how the action buttons are on opposite sides of the controller either. Atari also took out the Pause, Number keypad, and Reset buttons too from the innovative but ultimate flawed 5200 controller which is a odd choice. There were also other NES-like controllers for the 7800 but they were only released in Europe , so we we're out of luck unless you import them. Bottomline: Less than a hundred 7800 games were made for this system, and it depresses me to even talk about it really, but hey, at least it backward compatible with the Atari 2600 games (but not the Atari 5200 games unfortunately), that alone makes it worth buying. Although most of the games are not of NES calibre, it's still good for retro fanatics. Rating: 64/100 good.... just not NES good. 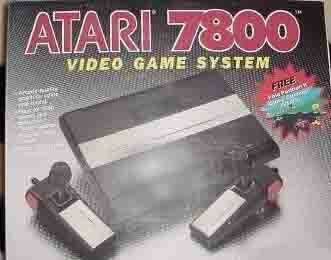 Find The Atari 7800 Prosystem on eBay here! RARE SCALE: 6/10 a tougher find than the 2600 but it's not has rare has the 5200.